Rajinikanth Film Review From Hum. Hum Movie. Rajini Film Hum. 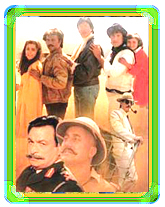 Rajinikanth Hum movie. www.rajinikanth.com. Bhaktawar (Danny Denzongpa) is a criminal mastermind, and his most active territory is the dockyard. He constantly gets irritated by the dockyard's union leader, Tiger (Amitabh Bachchan), and only tolerates him, because Tiger's dad Deepak Shirke) is his bodyguard. During a confrontation between Tiger and Bhaktawar, Bhaktawar is reportedly killed, and Tiger has to run for his life, this time from the police, even abandoning his love Jumalina Gonsalves (Kimi Katkar). Years later, Tiger surfaces as a bespectacled mild-mannered man, with two younger brothers (Rajnikant & Govinda), one of whom is a police inspector. Soon the past catches up with Tiger (or Shekhar as he calls himself now), and he must now come to terms with it, and avoid being arrested by his brother.